Portraits of Colonial Natal, recently launched at Adams Musgrave Branch, is a collection of scholarly essays by Dr Duncan Du Bois. His previous books are: Sugar and Settlers: A history of the Natal South Coast 1850-1910 and Labourer or Settler? Colonial Natal’s Indian Dilemma. 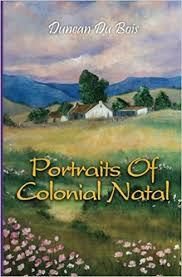 At a time when a leading politician’s career has been blighted because she made objective remarks about the legacies of colonialism, the publication of Portraits of Colonial Natal provides a wide-ranging account of pioneers, places and prejudices without fear or favour. Comprising 12 chapters, the book balances settler enterprise, initiatives and hardships with accounts of discrimination and human rights abuses. It also includes a ground-breaking study of Joseph Baynes as a pioneer in the liberalisation of race relations. Anecdotal detail gleaned from colonial newspapers and unpublished correspondence in the Pietermaritzburg Archives revives bygone times and characters in focusing on travel and transport and settler nodes such as Umzinto and Umkomaas. Two chapters focus on the experiences of Indians. One examines the abuse of indentured labourers; the other charts the evolution of prejudice against Indians as settlers and entrepreneurs.